This cute little grey wooden toy car comes with a blue wooden figure which can be taken out of the car. Perfect as addition to your Lubu Town construction sets, but also a nice little present on its own. Suitable for girls and boys between 3 and 8 years. Made in Europe with natural beech wood. Available in 4 different colours. Product includes one car (grey) and one figure (blue). Warning! Not suitable for children under 3 years of age –choking hazard due to small parts. 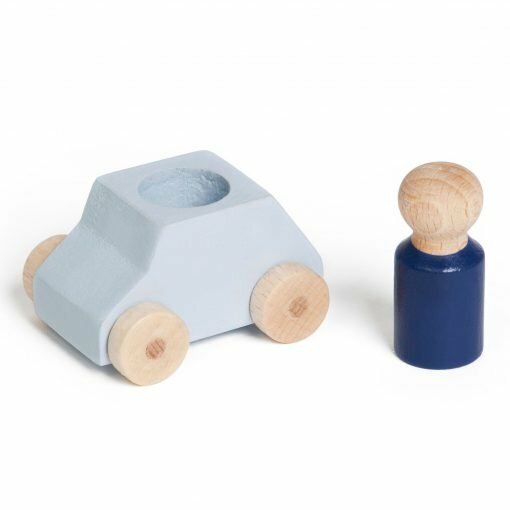 This cute little grey wooden toy car comes with a blue wooden figure which can be taken out of the car. Perfect as addition to your Lubu Town construction sets, but also a nice little present on its own. Suitable for girls and boys between 3 and 8 years. Made in Europe with natural beech wood. Available in 4 different colours. Product includes one car (grey) and one figure (blue). Also available in blue, red and turquoise.